Despite the Islands recent battering from the ‘Beast From the East’, Spring will still arrive earlier at Ventnor Botanic Garden than elsewhere on the Island, making it a beautiful place to visit during Easter! We have lots of fun and creative activities for families this Easter including pottery painting, drawing competitions, best dressed bunny fancy dress, biscuit decorating and an April Fools’ Easter East Egg Hunt – which will be great fun! There is also a free daily Garden Easter trail – just pick up a map and hunt for the clues to claim your reward! Kids Drawing Competition. A prize for best drawing in each of three age categories: 1-5, 6.-11, 12-16. An inside drawing station will be available throughout the holidays so a great pastime for any rainy spells. Free to enter. Easter Sunday Roast in our edulis Restaurant. A delicious Easter Sunday roast of Lamb or Chicken, with all the trimmings, using local Isle of Wight produce. A vegetarian roast option is available. £10.95 per adulst, £6.95 per child, served between 12 noon and 3pm. Booking Advisable. Best Dressed Bunny Fancy Dress Competition. Enjoy games, music and refreshments. 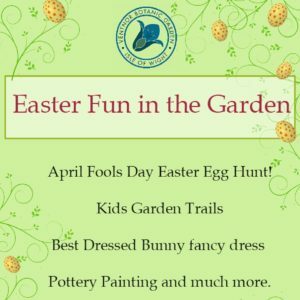 Hop along to the garden in your best funny bunny outfit for a chance to win a great prize (cost £2.00 per child, 11am – 12pm with judging and Prize giving at 12 noon). Experience a sense of the Australian Outback with Didgeridoo player Joe Caudwell. He will be in the Australian garden to celebrate the new wall painting. The official opening for the Australian Dreamtime Rock will be at 12 noon – so come listen to the eerie didgeridoo, observe the ceremonial herb-burning and enjoy some unusual face-painting for the kids. Costs may apply. Sunday Roast in our edulis Restaurant. A delicious Easter Sunday roast of Lamb or Chicken, with all the trimmings, using local Isle of Wight produce. A vegetarian roast option is available. £10.95 per adulst, £6.95 per child, served between 12 noon and 3pm. Booking advisable. Sunday Roast in our edulis Restaurant. A delicious Easter Sunday roast of Lamb or Chicken, with all the trimmings, using local Isle of Wight produce. A vegetarian roast option is available. £10.95 per adults, £6.95 per child, served between 12 noon and 3pm. Booking advisable.